Your locks are your best line of defense. Choose Lock N More f or your residential lock repair, and be confident. Even the best locks are subject to normal wear and tear that can lead to a malfunction. That’s why when you have a lock that is not working correctly, Lock N More is the name you can trust to fix it. 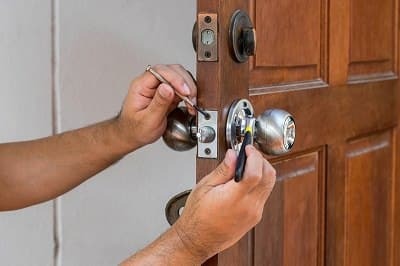 So, if the key won’t turn, or the lock won’t lock, call Lock N More, the most-trusted locksmith in Broward, Miami-Dade, and Palm Beach Counties. We are available 24 hours a day, 7 days a week, and we come to you fast! Nights? Weekends? No problem. There are never additional charges based on when we do the work! Lock N More is fully licensed and insured. And, your safety is important to us. We carefully background-check all our residential locksmiths, so you always get the security and high-quality service you expect. If my key is stuck in the lock, will I need a new lock? Not necessarily. Sometimes, the key sticks because of worn or broken tumbler pins or wafers. The rest of the lock may be fine. In these cases, we can usually replace the worn parts and repair the lock. We will let you know if we need to replace the lock. Can you fix a key that broke off inside my door? Yes. We have special tools that can remove the broken fragment from the lock. Once we get the broken part out, we’ll see if another key still works the lock. If it does, then the problem was with a worn key. If it doesn’t, then the problem is inside the lock and we may need to repair or change it. Can I schedule an appointment outside of normal business hours? Yes! We are a 24/7 locksmith, and we can accommodate any customer’s schedule. Can you repair the decorative antique locks that I love? That depends upon what the problem is with the lock and its condition. However, we will do everything possible to save your expensive, decorative locks by repairing them instead of replacing them.